Over the last several years we have found that Longoni tables to be of an outstanding build quality and playing standard. Longoni are manufactured in Italy to the highest of standard. 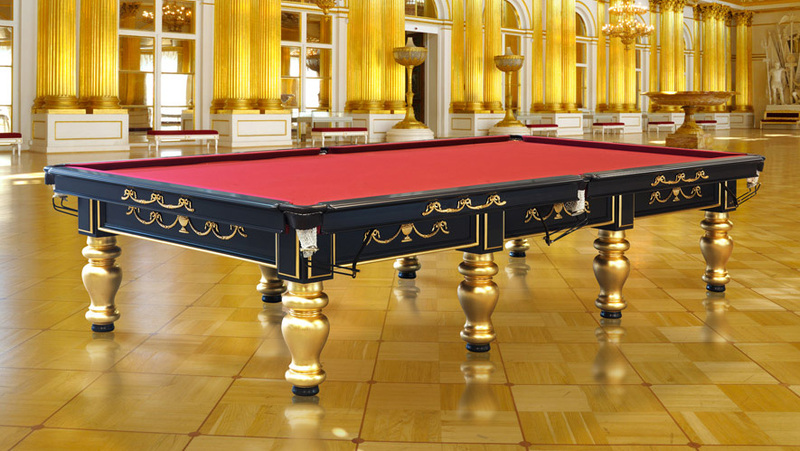 We do not carry Longoni pool tables in stock, these are imported to order so to keep the price to a minimum on storage and transport while tables like the Las Vegas Silver is a custom made table. Lead time is generally 4 weeks on a new table, custom colour or finish can take 1 week longer. You will not better our prices on these tables anywhere, look around and you will find we discount our tables by a considerable amount over other suppliers prices! We keep our prices as low as is possible. The Revolution is a masterpiece of Italian cabinet making. Entirely made in solid tulipier, it is the original copy of a famous branded table built in Turin during the very early years of last... century. The side aprons are one of the most precious features of this table, they are in solid wood hand crafted and carved with flower design. Pocket garments are in bronze with hand carved flower figure. Slate: 3 x 45mm thick. Playing area: 270 cm x 135 cm. 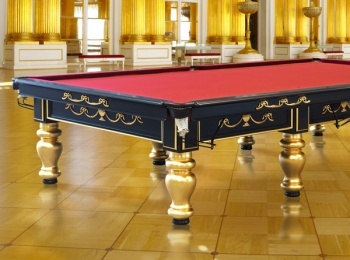 The price is for an 10' Revolution Russian pyramid billiards table and includes deliver and installation on the ground floor within 25k of Fuengirola, enquire if you are unsure. Slate: 5 x 45mm thick. Playing area: 360 cm x 180 cm. The price is for an 12' Revolution Russian pyramid billiards table and includes deliver and installation on the ground floor within 25k of Fuengirola, enquire if you are unsure. Note: This image is of a 10' table, the 12' table has 8 legs. The Imperia is one of the most precious billiard tables in the Longoni line. Entirely made in solid wood. The cushions of this table are made in dried wood with regular template for russian pyramid... or snooker. Slate: 3 x 38mm thick. Playing area: 284 cm x 142 cm. Supplied with: 1 x set of russian pyramid balls 68mm dia. 4 x Russian pyramid cues at 160 cm long. 1 x Plastic dust cover. 1 x box of chalk 1 x Brush 1 x triangle 1 x cue rest. The price is for an 10' Imperia Russian pyramid billiards table and includes deliver and installation on the ground floor within 25k of Fuengirola, enquire if you are unsure. 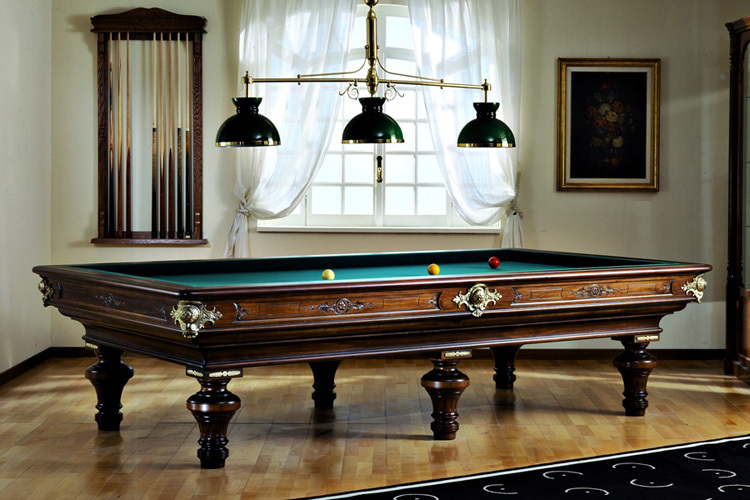 The Imperia is one of the most precious billiard tables in the Longoni line. Entirely made in solid wood. The cushions of this table are made in dried wood with regular template for russian pyramid... or snooker. Slate: 5 x 38mm thick. 1 x set of russian pyramid balls 68mm dia. 4 x Russian pyramid cues at 160 cm long. 1 x Plastic dust cover. The price is for an 12' Imperia Russian pyramid billiards table and includes deliver and installation on the ground floor within 25k of Fuengirola, enquire if you are unsure.